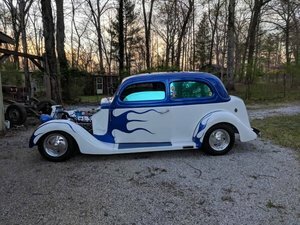 1935 Ford Tudor Sedan. Excellent condition. Low miles. Great paint with beautiful pinstriping. Excellent interior. Small block Ford engine and Ford transmission. Disk brakes on front. Please Note The Following **Vehicle Location is at our clients home and Not In Cadillac, Michigan. **We do have a showroom with about 25 cars that is by appointment only **Please Call First and talk to one of our reps at 231-468-2809 EXT 1 ** FREE Consignment Visit Our Site Today Easy To List Your Vehicle and Get it Sold in Record Time. Classic Car Deals offers many fine classic cars for you to choose from. Our headquarters are in Michigan, but our cars are located in different states, so please be sure call and check on the location. If you don't see your dream car, don't worry CCD has clients all over the USA, so we can get you exactly what you want. Your first step to buying your dream car is to contact one of our reps today.